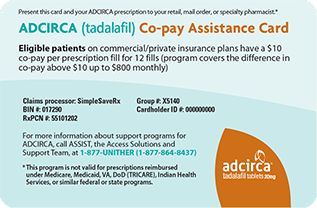 ADCIRCA® (tadalafil) is a prescription medication used to treat pulmonary arterial hypertension (PAH) (WHO Group 1) to improve exercise ability. Studies establishing effectiveness included predominately patients with NYHA Functional Class II–III symptoms and etiologies of idiopathic or heritable PAH (61%) or PAH associated with connective tissue diseases (23%). *Patients are not eligible for this program if their prescriptions are reimbursed under Medicare, Medicaid, VA, DoD (TRICARE), Indian Health Service, or similar federal or state programs. United Therapeutics Corporation reserves the right to modify or terminate this program at any time without notice. Patient Information or call 1-800-545-5979. © 2017 United Therapeutics Corporation. All rights reserved. ADCIRCA and Cialis are registered trademarks of Eli Lilly and Company, 2017. All other trademarks and registered trademarks are the property of their respective owners and are not affiliated with and do not endorse Eli Lilly and Company or its products.